To mark the centenary of the May Fourth Movement, the Dr Sun Yat-sen Museum is holding an exhibition "The Awakening of a Generation: The May Fourth and New Culture Movement" from 26th April to 25th August 2019. The exhibition features 81 sets of precious artefacts and historical documents to revisit the movement that illustrated the patriotism and national awareness of the Chinese people, and to let visitors understand its impact and significance in the development of modern China. Highlight exhibits include "Qingnian Zazhi" (Youth Magazine or La Jeunesse) founded by Chen Duxiu in 1915; the "Xinchao" (The Renaissance) magazine sent by Fu Sinian to his friend; the appointment letter issued to Lu Xun by the Chinese Department of Peking University; "Wuren Zuihou Zhi Juewu" (Our Final Awakening) written by Chen Duxiu in 1916; "Kexue Huabao" (Popular Science) published in 1933; Hu Shih's "Wenxue Gailiang Chuyi" (Preliminary Discussion on Literature Reform) copied by Qian Xuantong in 1920; and the first edition of Lu Xun's first collection of short stories, "Nahan" (Call to Arms). To coincide with the exhibition, Associate Professor of the Academy of Visual Arts of the Hong Kong Baptist University Dr Daniel Lau, along with students and alumni of the academy, were invited to create a series of artworks on the exhibition theme to echo the spirit and patriotic feelings of students 100 years ago. These artworks are also displayed in the exhibition. The exhibition is jointly presented by the Leisure and Cultural Services Department and the Beijing Lu Xun Museum (the New Culture Movement Memorial of Beijing), and organised by the Dr Sun Yat-sen Museum. Admission is free. 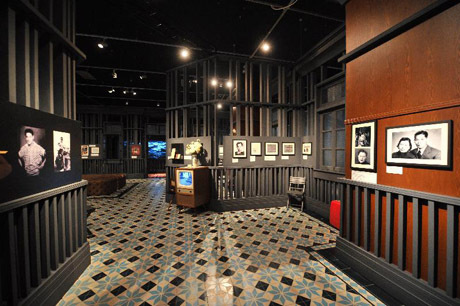 Dr Sun Yat-sen Museum is located at 7 Castle Road, Mid-Levels, Central. It is open Monday to Wednesday and Friday from 10am - 6pm, Saturday, Sunday and public holidays from 10am - 7pm. Closed on Thursdays (except public holidays). Two arts projects "Once lost but now found" and "Contagious Reading" are being held at Oi! from 22nd March 2019. The former exhibition sees artists respond to the environment and the location of the venue, thus creating artworks with the elements of a city by the sea, while the latter project hold workshops by drawing inspiration from stories about libraries with the aim of sharing insights into the power of reading and art. The "Once lost but now found" exhibition runs until July 28 2019, while the "Contagious Reading" project will showcase its outcome in three stages. The first stage of the project runs from 22nd March to 18th April 18th while the second and third stages will run from 26th April to 23rd May and from 31st May to 23rd June respectively. Oi! is located at 12 Oil Street, North Point (Fortress Hill MTR Station Exit A) It is open Monday : 2:00pm — 8:00pm, Tuesday to Sunday : 10:00am — 8:00pm, Christmas Eve and Chinese New Year's Eve : closed at 5:00pm, Closed on Mondays from 10:00am to 2:00pm (except public holidays), and the first two days of the Chinese New Year. Admission is free. 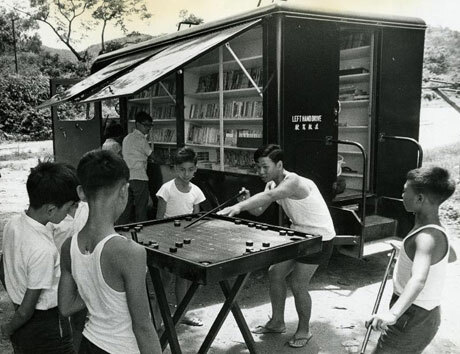 The Public Records Office (PRO) of the Hong Kong Government Records Service is holding the "Pleasure and Leisure: A Glimpse of Children's Pastimes in Hong Kong" exhibition at the Hong Kong Public Records Building from 25th February to 31st December 2019 to showcase how children's pastimes in Hong Kong evolved from the 1950s to the 1980s through the display of a variety of the PRO's holdings. Apart from reliving childhood moments, one can also learn more about the transformation of Hong Kong's society and livelihoods in those years. The historical photographs, audio-visual materials and government archival records on display in the exhibition document how children spent their leisure time in the old days, as well as how toys and games, recreational facilities and community activities catering for children evolved over the decades. The variety of the exhibits is enriched by the Hong Kong Museum of History and local toy collectors Mr Chong Hing-fai, Mr Ricky Lau and Mr Eddie Yuen, who generously allowed their precious toy collections to be displayed in turn during the exhibition period. While immersing in childhood joy, visitors will also be able to understand more about the different facets of Hong Kong's society and people's lives in those days. The PRO has for the first time combined an exhibition with two public engagement programmes, namely "Childlike Innocence on Camera" and "Share the Joy", inviting members of the public to contribute photographs taken from the 1950s to the 1980s that depict their childhood play times and contribute plastic or metallic toys popular at any time during the same period. Selected photographs and toys contributed by the public will be uploaded to the exhibition's dedicated webpage and displayed in the Exhibition Hall respectively, thereby completing the exhibition as a collage of fond memories of fun childhood times unique to each and every person. The exhibition is located at Exhibition Hall, 2/F, Hong Kong Public Records Building, 13 Tsui Ping Road, Kwun Tong. Opening hours are from Monday to Friday from 9am to 5.45pm (closed on public holidays). Admission is free. "Cityscape in Sight and Sound", an exhibition organised by the Hong Kong Film Archive, is being held from 1st February to 5th May 2019 at the Exhibition Hall of the Hong Kong Film Archive. 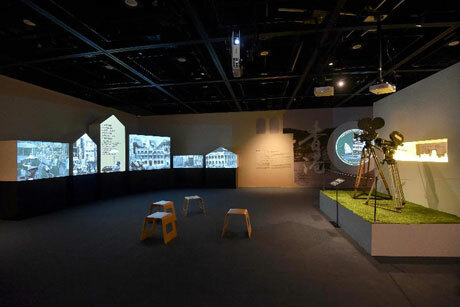 The exhibition offers visitors a glimpse of Hong Kong's past cityscape and landmarks through several hundred pieces of footage selected from Hong Kong Film Archive 's archival film collection, including documentaries and dramas from the late 19th century to the 1960s, as well as film posters and digital album of production stills. The exhibition begins with the oldest documentary in the Hong Kong Film Archive's collection, "The Edison Shorts", made by the Edison Company in 1898, which captured images of Hong Kong street scenes in late 19th century seen through the eyes of foreigners. Documentaries shot and donated by the former District Commissioner in the New Territories and Secretary for Home Affairs, Mr Denis Bray, record landscapes of the New Territories in the 1950's, which are being shown to the public for the first time. Films which were shot on location from the 1940's to 1960's record numerous landmarks that have disappeared or changed, such as Kai Tak Airport, the former Kowloon–Canton Railway terminus, the café Yucca de Lac, Lai Chi Kok Amusement Park and Queen's Theatre. While made for narrative purposes at the time, the scenes revealed in the films have become today's precious memories, as well as having historical significance. In addition, the exhibition displays two old cameras commonly used in the 1950s and 1960s allowing visitors to better understand the difficulties faced by cinematographers in bygone days, who had to carry bulky equipment for location filming. Part of the "Cityscape in Sight and Sound" Exhibition, being held at the exhibition hall of Hong Kong Film Archive. To complement the exhibition, two seminars in Cantonese will be held by the Hong Kong Film Archive at its Cinema. The first, entitled "Changing Times: Cityscape in Flux", will be held at 2-30pm on 17th February, with film researcher, Gary Wong as speaker. Another seminar, entitled "Cityscape: Stories of Built Heritage", will be held at 2-30pm on 17th March and will be hosted by the former Chief Curator of the Hong Kong Museum of History, Dr Joseph Ting. Hong Kong Film Archive is located at 50 Lei King Road, Sai Wan Ho (MTR Sai Wan Ho Station Exit A). It is open from 10am to 8pm (or 15 minutes after last screening) Sunday, Monday and Wednesday to Saturday. Christmas Eve and Chinese New Year’s Eve 10am to 5pm. Closed on Tuesdays (except on public holidays). The Box Office is open from 12noon to 8pm (or 15 minutes after the last screening). The Resource Centre is open Monday, Wednesday, Thursday and Friday 10am to 7pm, Saturday 10am to 5pm, Sunday and public holidays 1pm to 5pm. The Exhibition Hall opens 10am to 8pm but is closed when no exhibition is taking place. Admission is free. The "2018 Tea Ware by Hong Kong Potters" exhibition is being held from 5th December 2018 to 2nd December 2019 at the Flagstaff House Museum of Tea Ware. The exhibition shows the unlimited creativity of local potters, with more than 100 works from this year's tea ware competition on display. This year's competition received an enthusiastic response, with a record number of 451 entries submitted by 332 potters. In the Open Category, the first prize was awarded to Chan Cheuk-yan's "Encounter", while the second and the third prizes went to Enders Wong's "Joint Call" and Kwok Ka-fei's "Grand Canyon" respectively. The six winning entries for the prize of excellence were Hui Chun-kit's "Eclipse"; Enders Wong's "Your Charm, Your Way"; Monica Lin's "Gentle Thoughts"; Yung Yuk-ming's "Reverie"; Tung Wing-yin's "Encounter"; and Kwan Sau-man's "Paper Cup". First Prize winner in the Open Category, Chan Cheuk-yan's "Encounter"
In the School Category, the winner of the first prize was Lau Hui-yau's "Tip of Dawn at Sixteen", while the winners of the second and the third prizes were Nicholas Leung's "The Price of Peace" and Leung Ching-tung's "Tea Time" respectively. The "Tea Ware by Hong Kong Potters" competition was first held by the Flagstaff House Museum of Tea Ware in 1986 with the aim of promoting ceramic art in Hong Kong. This year's competition, the 11th edition, features 101 items of selected tea ware made by 88 local potters. Flagstaff House Museum of Tea Ware is located at 10 Cotton Tree Drive, Central, (inside Hong Kong Park). It is open from 10am to 6pm but closes at 5pm on Christmas Eve and Chinese New Year's Eve. Closed every Tuesday (except public holidays) and the first two days of Chinese New Year. Admission is free. This year marks the 40th anniversary of the passing away of the internationally renowned martial arts movie star Bruce Lee. A large-scale exhibition, "Bruce Lee: Kung Fu • Art • Life", is being held at the Hong Kong Heritage Museum in commemoration. Presented by the Hong Kong Government's Leisure and Cultural Services Department (LCSD) and jointly organised by the Bruce Lee Foundation and the Hong Kong Heritage Museum, the exhibition is one of the highlight programmes of the "Vibrant Hong Kong" theme under the territory-wide "Hong Kong: Our Home" Campaign launched this year. Sponsored by Fortune Star Media Limited, the exhibition is open from 20th July 2013 and runs for five years until 20th July 2018 at the Hong Kong Heritage Museum. Bruce Lee took kung fu to a whole new level of recognition and a new international audience with his natural charisma and physical prowess. He introduced Hong Kong to the world through his films and did more in this area than any other person. Movies such as "Fist of Fury", "The Way of the Dragon" and "Enter the Dragon" have been considered by film critics to be all-time classics that transcend generational, cultural and geographical boundaries. The exhibition takes visitors on a marvellous journey through the life and achievements of Lee: from a rebellious street fighting child growing up in Kowloon to accomplished Hollywood actor and director and revered kung fu master. Bruce Lee was born on 27th November 1940, in San Francisco. His father, Lee Hoi-chuen, was a celebrated Cantonese opera actor and his mother, Ho Oi-yee, was a daughter of prominent Hong Kong businessman Ho Kom-tong. Lee was brought back to Hong Kong when he was a newborn. Because of his father's strong connections to the world of show business, Lee first came into contact with cinema when he was an infant, making his silver screen debut as a baby in the Cantonese film "Golden Gate Girl", shot in the US in 1941. Outstanding performances in the films "The Kid" (1950) and "Infancy" (1951) earned him praise as a "genius child actor". He left for the US to pursue his studies in 1959 after finishing a final film in Hong Kong, "The Orphan" (1960). Lee was passionate about martial arts when he was small. He became a student of the Wing Chun grandmaster Ip Man at the age of 13. After he went to the US, the lifestyles and world views of Western society became catalysts for his new conception of the philosophy of martial arts. He began teaching Wing Chun when he was studying at Edison Technical School in Seattle, and later, in 1962, he founded his own Jun Fan Gung Fu Institute at a permanent venue. He also named the martial arts system that had been brewing in his mind Jeet Kune Do - a style with no fixed technical movements and no specific forms. In 1965, Lee was invited by 20th Century Fox to play the role of Kato in the US TV series "The Green Hornet". His agile and skilful kung fu alerted Hong Kong film producers to his talents, and in 1971 he returned to Hong Kong to resume his career and starred in a number of sensational movies, including "The Big Boss" (1971), "Fist of Fury" (1972), "The Way of the Dragon" (1972) and "Enter the Dragon" (1972). His true and hard-hitting kung fu and jaw-dropping nunchaku skills mesmerised audiences. Lee not only took Chinese kung fu films to the international market but also reached the peak of his life and his career. Sadly, he died suddenly during the shooting of his last film, "The Game of Death", on July 20, 1973, at the age of 32. 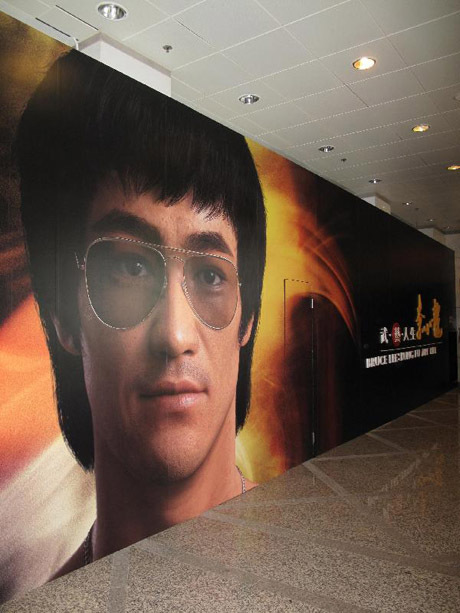 Occupying a total area of 850 square metres, the "Bruce Lee: Kung Fu • Art • Life" exhibition features more than 600 precious relics related to Bruce Lee on loan from a number of local and overseas collectors, including memorabilia of Lee and his costumes, books and gym equipment, as well as his articles. 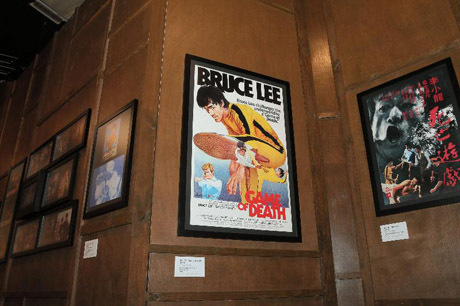 The exhibition gallery also houses several sets of reconstructions, which were created with ideas inspired by prominent scenes in Lee's five classic kung fu movies as well as his gym and his study. Also featuring a 3D hologram animation on Bruce Lee, a newly created 3.5-metre-high statue of Lee and the 75-minute documentary "The Brilliant Life of Bruce Lee", the exhibition will enable visitors to review Lee's life story based on his profile, his movies, his martial arts and his development as a cultural phenomenon from a more comprehensive, in-depth and independent perspective. The exhibition will also include a collector series in which the theme will be changed regularly to show the precious collections of different collectors with an aim of introducing the cultural significance and the influence of Bruce Lee through the collectors' eyes. The first exhibition in the collector series will feature more than 100 products related to the TV series "The Green Hornet" provided by internationally acclaimed US collector Perry Lee. Through this collection, visitors will be able to learn more about the first image of Bruce Lee branded by a US enterprise. To mark the first anniversary of the exhibition, in July 2014 the museum introduce 12 new sets of exhibits and graphic displays to add a new dimension to our appreciation of the life of the iconic kung fu master. These include Lee's own manuscripts analysing his persona (named Lee) in the film "Enter the Dragon" (loaned from the Bruce Lee Foundation), the metal claw designed by Lee as a prop for "Enter the Dragon" (loaned from Hong Kong collector Mr Stanley Zau Chwan-yeu) and a booked titled "Hu Wei San Jie Gun" ("Tiger Tail Three-section Cudgel") from Lee's personal library (loaned from American collector Mr Perry Lee). In addition, the main panel at the entrance of the exhibition has been replaced by a new design created by acclaimed Hong Kong computer animator Mr Shannon Ma, which shows Lee's more graceful side. It also offers visitors the chance to be photographed alongside an image of Lee, in which he is wearing sunglasses and a confident smile. The new main panel at the exhibition entrance, introduced to mark its first anniversary allows visitors to be photographed alongside the star. To tie in with the five-year exhibition, the Hong Kong Heritage Museum will organise a series of education and extension programmes with different themes which will be carried out in phases. The first phase of activities, under the theme "The Bruce Lee that Hong Kong Knew", will include lectures, sharing sessions and interactive demonstrations to explore the life, career and achievements of Bruce Lee from different perspectives. To enable the public to obtain more information about "Bruce Lee: Kung Fu • Art • Life" and to enhance their interest in the exhibition, interactive media will be employed along with social media, a dedicated exhibition website and smartphone apps. Members of the public will be able find from the LCSD's newly launched Facebook fan page, "Visit HK Museums" (www.facebook.com/VisitHKMuseums), a public engagement campaign, directional day tour and exhibition promotional videos, highlights of must-see exhibits, interviews, quotes and the making-of materials for the exhibition. During the early stage of the exhibition, the museum will arrange viewing sessions and online reservation of tickets for the first two months (from mid-July to mid-September) after the exhibition opens. Visitors can, via email, reserve tickets for a time slot that fits their schedule through the Hong Kong Heritage Museum's online reservation website at blor.lcsd.gov.hk. Visitors will also be able to purchase tickets at the museum. Interested parties will only be allowed to make reservations for a maximum of three viewing sessions and four tickets for each session during each phase of online reservation while the quota lasts. The quota will be available on a first-come, first-served basis. As the exhibition is classified as a long-term exhibition of Hong Kong Heritage Museum, visitors will only need to pay the museum's standard admission fees to visit the exhibition without any additional charges. However, visitors will be required to present the special admission slip for viewing the exhibition. Standard admission to the Hong Kong Heritage Museum is HK$10 with a half-price concession available for full-time Hong Kong students, people with disabilities and senior citizens aged 60 or above. Group tickets at HK$7 each are available to groups of 20 persons or more. Admission is free on Wednesdays. Hong Kong Heritage Museum is located at 1 Man Lam Road, Sha Tin. It is open from 10am to 6pm on weekdays, and from 10am to 7pm on Saturdays, Sundays and public holidays. It is closed on Tuesdays (except public holidays). 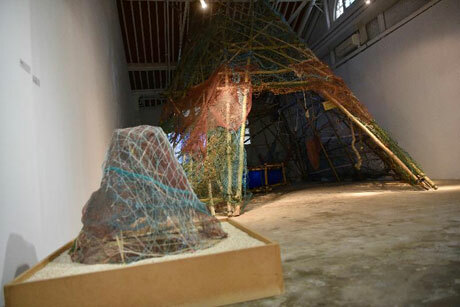 The museum is within three minutes walk of Che Kung Temple Station, on MTR Ma On Shan Line.